Keeping a variety of to do lists is the perfect way to keep all aspects of your life organized including both work and home. To that end, it can be a good idea to utilize different to list templates to help you organize every part of your life. 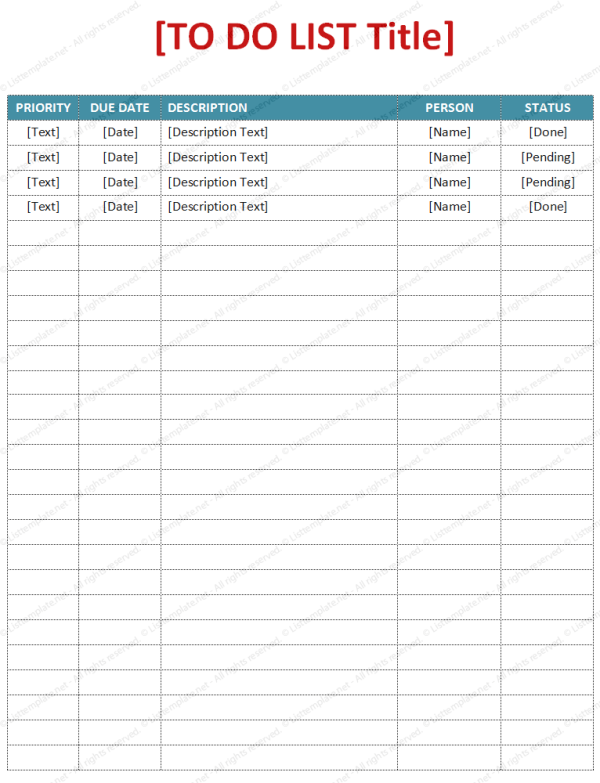 There are several great to do list templates that are perfect tools for keeping track of everything you need to get done your projects. Large projects can be difficult to manage but if you break it down into separate tasks, you will find even the largest projects are much easier to accomplish on time. 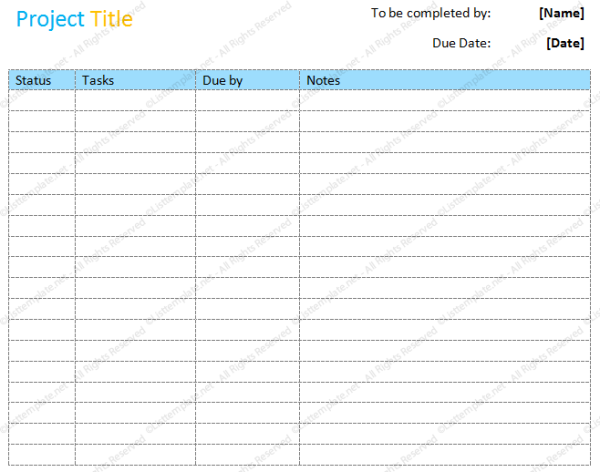 This project to do list template allows you to create a separate list for each major project with individual tasks. Each task can be tracked and checked off when complete so you can be sure your project is finished on time. Template is designed to look great, be easy to follow and read so they can be an effective tool for organizing your life. In addition, it is compatible with many different versions of Microsoft Office and are easy to customize so you can create the perfect template for you. Organizing your life can be tricky and time consuming, however, by utilizing a to do list template you can quickly and easily organize your life. Template by ListTemplate.net © 2014 – All rights reserved. 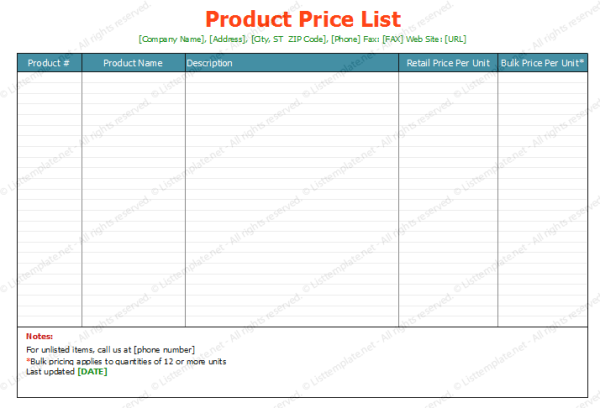 Visit Basic To Do List Template to download this template. 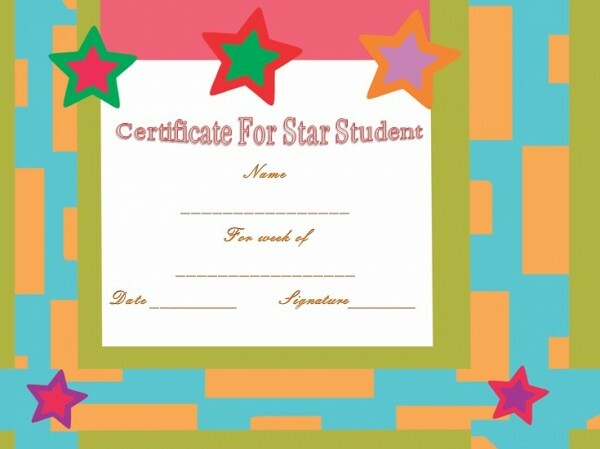 Have you ever wanted to give someone a special award but did not have the time or the talent to create one from scratch? This template will help you create an award for achievement for any sport. 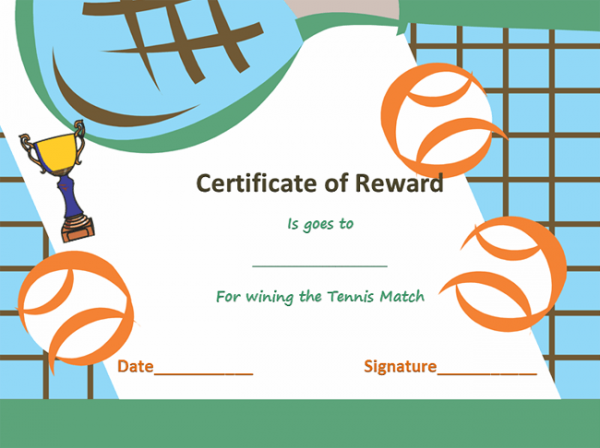 It is editable and totally versatile for other sports in addition to tennis. Not all award templates are alike. Some have features that are static and cannot be edited or modified. This form has the functionality to be used for many different occasions. If you like the style of this award template you can use it in its standard format as it was created. It has many features to personalize this form. The artistic design can be modified to fit all of your team members and individualized for each player. This is a very useful tool for a busy coach that may not have the computer skills to create an award from scratch. This award is for you. Template contains an artistic design that is modifiable to fit your specific sport or recreational activity. Document contains editable text features that can be used to highlight specific accomplishments of the award. Editable name field for personalization is included – Each team member can be recognized with just a click of the mouse. Movable art features create a very user-friendly design that can be personalized to accommodate your specific tastes. Color scheme can be adjusted to match team colors or your favorite color. Awards make people feel special about their accomplishments. Not all coaches, mentors or supervisors have the computer skills or the time to create an award from scratch within an artistic framework. This template will be perfect for anyone who wants to let a team member or athlete feel special about their accomplishments. 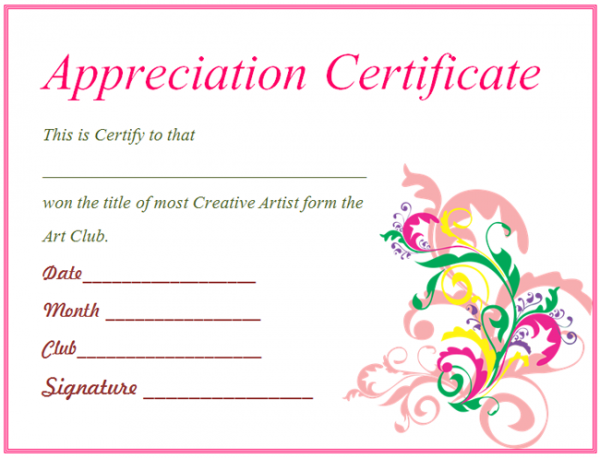 You can download more similar award certificate template from get certificates. Awards are especially important for children of all ages to help them feel like part of the team. Business meeting minutes are a very important record that allows managers to propose and document action items to develop and complete projects and key objectives for their organization. Minutes also serve as a reference when reviewing previous meeting topics to set ongoing and follow up agendas. Meeting minutes need to be recorded quickly to capture several important details such as who the speaker is, which topic and issues are being presented, how the topic is decided upon, and any further actions that need to be addressed along with the responsible party for completing such actions. Meeting minute templates are a fantastic tool for quickly keeping these records since the formatting work is already in place for the typist. Administrative professionals can easily fill in our meeting minutes templates quickly, allowing them to observe and record important and key data from the meeting. Here we provide some useful sources all the templates are professional and meeting minute templates from these resources are customizable so that each template is the perfect solution to any kind of meeting. From corporate finance templates to informal weekly staff meeting templates, they have a template to help appropriately record any subject matter. Out there are many sites have a very large database of templates for example © Dotxes has created all templates from user requests and we are proud of them that they are delivering high quality templates based on this demand. As always, Dotxes and other sites welcome you for custom template requests and are delighted to help create a meeting minute template based on your direction. Meeting minute template allow you to create uniform meeting minute records for your organization. If you like this post and are satisfied with these resources of meeting minute templates, please share your positive feedback on your social-media profiles and share this post with your colleagues! Together we will be able to configure and meet the needs of a variety of business organizations with templates and your feedback. A lease agreement is written when owner renting out its property to lessee and in return receive money as rent. Property given at rent may be an apartment, home or even a room in your house. Why lease rental agreement is necessary? Lease rental agreement explains all the terms and condition which a lessee has to obey. If lease rental agreement is not signed between owner and lessee then you cannot impose rules and regulations on the tenant. It will difficult for you to prove in court in the case of violation of rule that is not written or signed. Any damage of your property by tenants will not be compensated without agreement. Both parties are protected from fraud by using standard lease agreement documents that covers all aspects o rental situations. Standard lease agreement ensures all of your demands. It also tells the tenant about his responsibilities. It enforces tenants to obey all the rules and regulations otherwise he will pay for it. This agreement saves the rights of tenants as well. No one can evict him before decided time duration. For making lease agreement you don’t have to start from beginning. Use lease rental agreement template. It is just perfect for you if you want to make rental agreement. You should also visit how to customize own professional rental agreement. Here is a link given below. It will give you lease agreement template for downloading. It includes all the necessary information related to lease agreement. How to deal with template? Download the rental agreement template. Fill your specific terms and conditions in the document. Take print out of it so you can able to present it to the tenants. This will save your contract from disagreement.